Paula Kucera and her husband David own the former Shaefer farm, where they built a house on a hill. They moved to their current home on the property 13 years ago, and about five years later, Paula opened her wool shop in the large white barn that had once been used for cows. She called it White Barn Sheep and Wool. 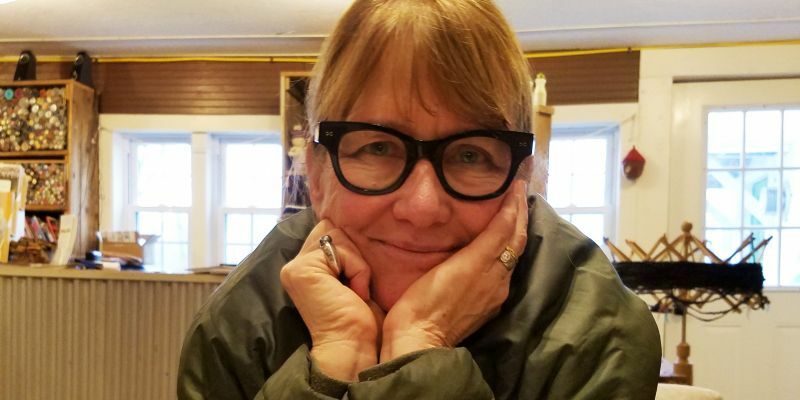 Paula had been a decorative artist for 25 years, but she was looking for something new, sustainable and connected to the land, that would let her express her artistic side. She had always been a knitter, so given that she now had a barn and pasture, it occurred to her to raise sheep for wool. Paula focused on sheep that would produce the quality of wool she wanted and chose a breed called Cormo, which was developed in Tasmania in the 1960s by crossing a Corriedale ram with a Saxon Merino ewe. The breed is fast-growing, highly fertile, and provides very fine wool (18 to 23 microns), has terrific “crimp” (waviness), and is very soft. Paula keeps a flock of about 60 sheep, which she feels is sustainable for the land on which they pasture. At lambing season, there may be 20 to 30 more, but she keeps the number at 60, selling the rest. There are three rams, one of which is a chocolate Merino. The breeding season is controlled so that the ewes only bear in the spring. If ewes birth in the barn during winter, new mothers may walk away, leaving Paula to look after the lambs and try to get them to bond with the mothers. Carl Borucki, Paula’s friend, helps when needed with inoculations, cleaning of hooves, and birthing, and Noreen, who works at the farm across the road, brings her shepherd dogs to help with herding the flock. Shearing, Paula explained, is a highly specialized procedure. While there are many shearers in Australia and New Zealand, there are very few in the United States. She was fortunate to find Aaron Loux, from Massachusetts, who is very adept. It’s critical that the shearing remove all the wool in a single pass, lest there be clumps of wool, which are useless. The coat is then laid out on the ground and the perimeter fibers, which come from the belly, are separated; they’ve collected mud and other detritus and are unusable for yarn. The coats are then bagged and taken to a mill in Greenwich, NY, where the wool is carded and spun. Very fine yarn is the result, which she takes back to the barn, where it will be dyed and packaged for sale. Paula also carries the yarns of other producers in order to offer as wide a selection as she can.